Choice of Workers: A or B | THERMO Spoken Here! Basic mechanics can be used with the energy equation to evaluate the efficacies of work tasks. Consider the manners by which each of two workers moves a BOX (m = 12kg) kilograms from the storage floor to the tailgate of a truck. Use the data of the figures. ii) the average power (W), for the moving events of A and B as described below. From the floor (1), the BOX is lifted waist-high, then carried and placed on truck tailgate (2). zero change of internal energy of the BOX. Next separate variables and apply the integration operators ( ?). The limits are the time of initiation (call that time "0+") and a second time, an increment of time later, t = t + ?t = 0 + ?t. The energies, left-of-equality, integrate directly since the integrand is unity (one or "1"). Mathematics calls differentials of integrals having "1" as the integrand, Exact differentials. To integrate the work-rate, (right-of-equality) will require some thought. The summation (S) reminds us to identify all applicable manners of work of the event. There are two forces that act on the BOX. The first and larger is the force applied by the person who moves it. A second force is the force of drag, the force of resistance exerted by the surrounding air as the BOX moves through it. to become increments of energy. Equations (1), (2) and (3), express work rate not as W but as W(t). This makes the point that the work-rate of the mover (A or B) might vary over the duration of the event. Generally work is a function of time but given too little data, we cannot perform the integration. To proceed (to get some answer) we apply the Mean Value Theorem of Calculus to the work integral (3 - below). How large might it be? Of the three terms, term (3) is determined last (as the sum of terms (1) and (2)). Term (2) evaluates readily. It is simply the mass times gravity times the height of lift - (2) in Eqn-5. About the kinetic energy, a first thought might go like this. The Box velocity is initially zero. The worker picks it up then does work to give it some speed of motion (ΔKE > 0). But at the end of the event the BOX is slowed, does it "give" work back to the worker? For the event is ΔKE zero hence no contribution to the worker's average work rate? Nonsense! The worker must apply effort to give the BOX speed (and that KE) but none of that effort is returned upon slowing of the box to a stop. So how can the contribution of ΔKE be approximated? Let's break the ΔKE into two pieces. (5) The kinetic energy could be very large. (6) We can calculate the least average speed. (8) Least average power of Worker A. Next we investigate the task as done by Worker B. The image (below right)shows characteristics of the action as he moves a BOX onto the truck tailgate. From the floor (1) needing 2 seconds the BOX is lifted waist-high (2). 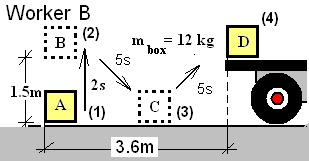 Carrying toward the truck requires 4 seconds but the BOX is dropped (3). Lifted again to waist-height, in 4 seconds, the BOX is placed on the tailgate. The BOX location and properties, and event duration are the same as for Worker A. Results of that analysis can be used (with some thought). the terms until the last step.